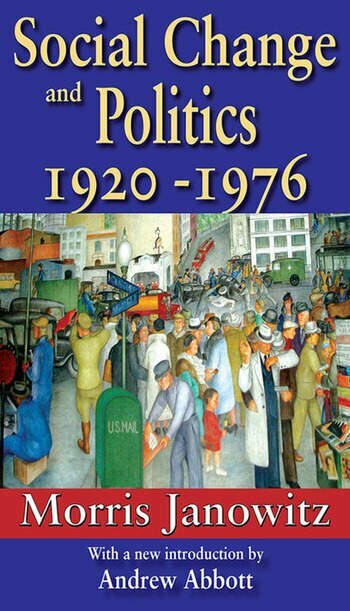 This classic study deals with social control in advanced industrial society, especially the United States, and particularly the half-century after World War I. The United States is representative of Western advanced industrial nations that have been faced with marked strain in their political institutions. These nation-states have been experiencing a decline in popular confidence and distrust of the political process, an absence of decisive legislative majorities, and an increased inability to govern effectively, that is, to balance and to contain competing interest group demands and resolve political conflicts. Janowitz uses the sociological idea of social control to explore the sources of these political dilemmas. Social control does not imply coercion or the repression of the individual by societal institutions. Social control is, rather, the face of coercive control. It refers to the capacity of a social group, including a whole society, to regulate itself. Self-regulation implies a set of higher moral principles beyond those of self-interest. Since the end of World War II, the expanded scope of empirical research has profoundly transformed the sociological discipline. The repeated efforts to achieve a theoretical reformulation have left a positive residue, but there have been no new conceptual breakthroughs that are compelling. This book is a concerted and detailed effort organize and to make sense out of the vastly increased body of empirical research.